More is better. The mantra of the signature stuffer. From job titles and contact details to special offers and even instructions to save the trees. Nothing is off limits when it comes to providing ‘useful’ information to our lucky recipients by the medium of email footer. It’s a perfect picture unless of course, you’re the poor soul tasked with making sure the emails your company sends are consistent, professional and accurate. If you’re that person, you’re going to love this latest MDaemon release. In keeping with the slightly random pre-Christmas tradition of slashing prices like crazy in order to draw a crowd, we too will be offering an unbeatable Black Friday discount. 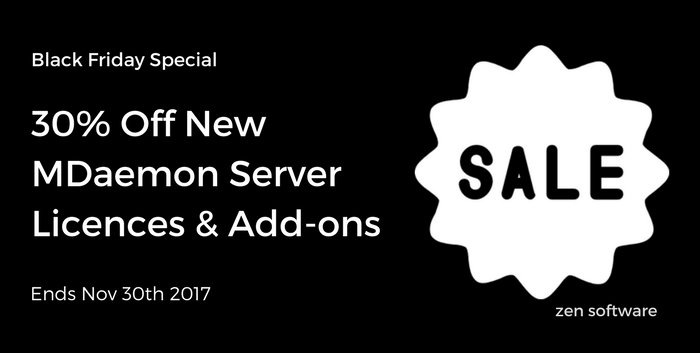 Until the end of November, we’ll cut the cost of buying any new MDaemon Email Server licence or add-on by a generous 30% off the advertised RRP’s. 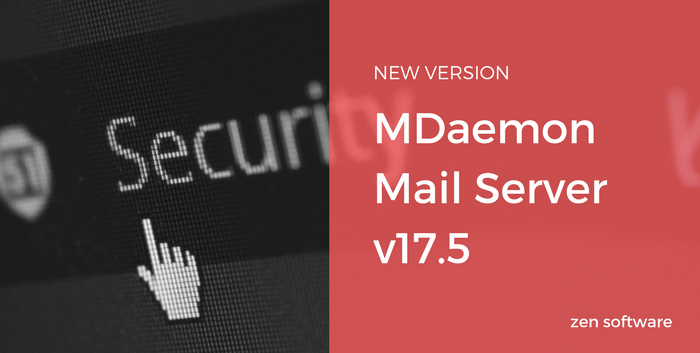 MDaemon has long been a popular alternative to cloud email services such as Office365 for companies who demand the security, control and flexibility of their own email server. 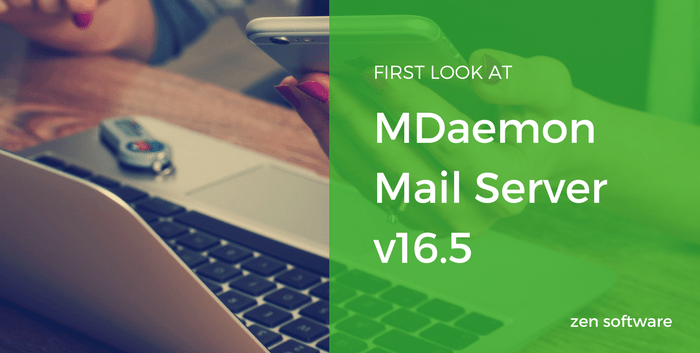 MDaemon remains the leading alternative to Microsoft Exchange and Office 365, providing companies who need the security and control of their own mail server with easy to use features at a highly competitive price. 25 years on from MDaemon’s launch, we see Texas-based developer Alt-N Technologies add yet more features to boost security and an update for Outlook Connector. Here are my highlights – don’t forget, you can find the full exhaustive list of goodies in the MDaemon Release Notes. With 205 million messages being sent every day, email still remains one of the most popular ways to communicate, which means the mailboxes of many businesses today contain all manner of information concerning both customers and staff. Whether it’s bank details, employment contracts, IP addresses or altogether more sensitive information, the introduction of the Global Data Protection Regulation (GDPR) in May next year will force companies to take the responsibility of managing this data seriously. Unless you’ve somehow managed to avoid both the news headlines and the barrage of content from IT security vendors that followed, you’ll no doubt be aware that a couple of weeks ago, there was a particularly severe ransomware attack that affected over 100,000 businesses around the globe, including the NHS. The latest evidence indicates that the recent ‘WannaCry’ attack originated via an exploit tool created by the NSA, however it’s more common they originate via ‘phishing’ emails, the technique of tricking recipients into clicking a malicious link or opening an attachment, often appearing to be from a colleague or relative. So with this in mind, now seems like a great time to give you a refresher on the features at your disposal as an MDaemon administrator to help prevent the type of phishing attack that can lead to a ransomware infection, along with some additional tips on best practice. Legally secure, fully automated email archiving is something that every business can benefit from, regardless of size or industry. 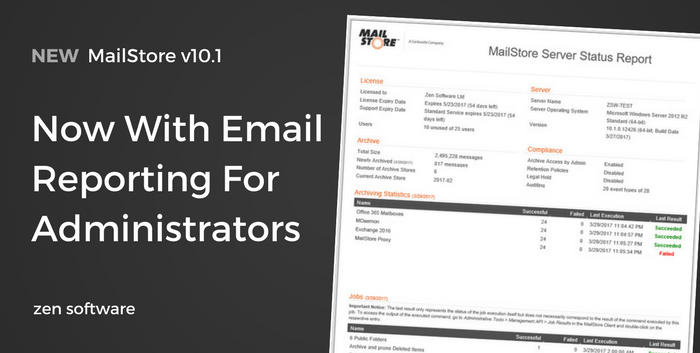 Today MailStore Server, the world’s leading e-mail archiving solution expands its extensive feature set, to include individual email reports, advanced search settings for users, and further enhancements for administrators. 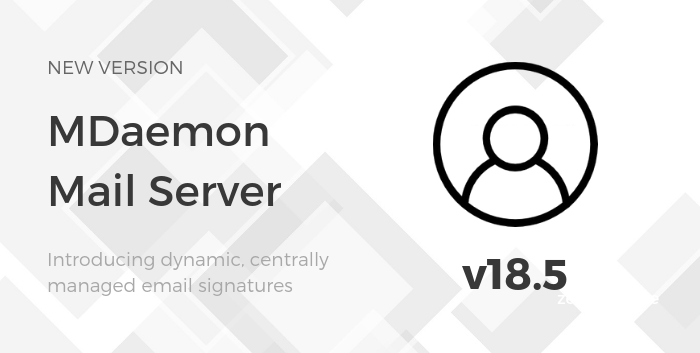 MDaemon has long been a favourite for small businesses who demand the security and control only a dedicated email server can offer. In this latest major release, Texas-based developer Alt-N Technologies add yet more features to boost security, plus a raft of enhancements for users of their webmail service, a desktop replacement and genuine alternative to Outlook. 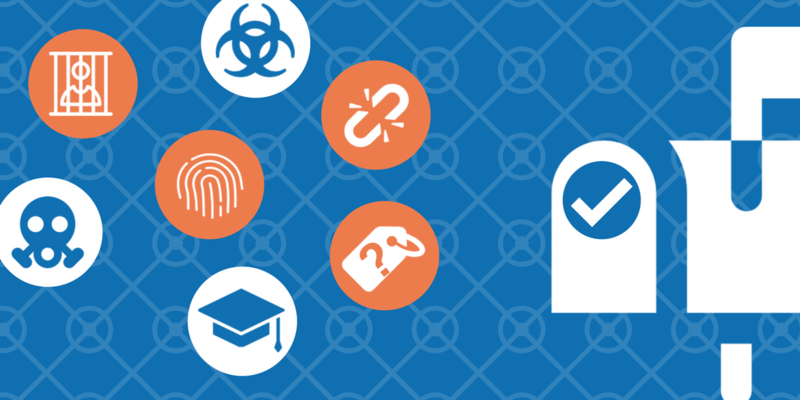 A popular feature of MDaemon is its ability to let administrators quickly pinpoint message activity and session information using detailed logs. 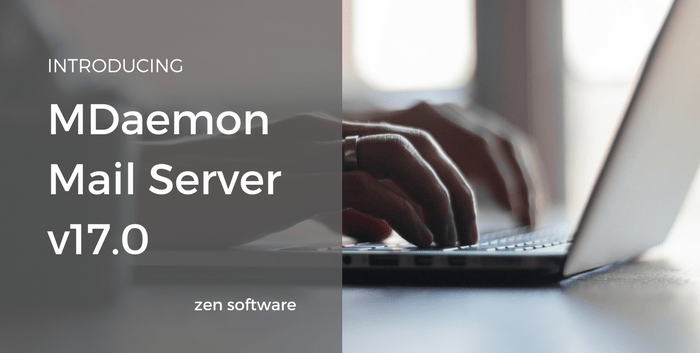 Sometimes, however, what’s required is more an overview of server usage such as how load is being shared across users or mailboxes for example. In this post I take a look at how you can use Microsoft Excel to query data you may not even be aware is available in MDaemon! It’s inconvenient, it undoubtedly costs your business money and it has the potential to cause you headaches of epic proportions. Perhaps that’s not the greatest sales strap line you’ve ever read? Well, that’s because I’m not referring to MDaemon, in this case, I’m talking about your friend and mine, spam email. You know, that particularly enjoyable type where seemingly innocuous messages from colleagues/ suppliers/ customers, turn out to be from one of those aspiring Mr. Robot types hell-bent on crypto’ing the life out of your data. In 16.5 there’s less chance of that happening as one of the new features of interest is the simple, but effective ‘From Header Protection/ Modification’. That’s not all – there’s auto-updating, centralised Outlook Connector settings, an XMPP server (yes, I had to Google it too) and some improvements to Worldclient you’ve been asking for. Here are my highlights – as usual, you can find the exhaustive version available in the MDaemon Release Notes. How to check if somebody knows your password. 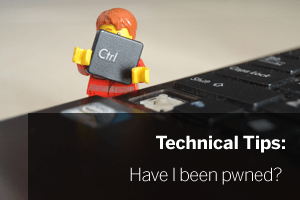 Have you been ‘pwned’? If you read my post on ‘spear phishing’ you’ll be aware that the hijacking of email accounts is on the rise. These attacks generally revolve around the attacker already knowing the login details for the account somehow. When I speak to customers they often wonder how the attacker knew their seemingly complex password. Did they simply guess it? The simple answer is no, in my opinion, that’s very unlikely. It’s much more likely that the email address and password were used on another site/ service which has led to them being compromised or ‘pwned’.